I spent last night sewing wool onto a beanie hat. This is the result. I found the tutorial ok to follow (you'll have to use a link from a previous post as I am on my phone and can't do anything fancy!). I think if I make another one (which I probably will ad I have 2 girls and would like fewer arguments to save my sanity!) I will have a clearer idea of how to sew on the "hair". There are some parts if the wig that are a bit bald if u move the hair too much. Smaller, closer stitches would provide a better covering /seems so obvious now! It wasn't too time consuming - took 2 hours of sitting in front of the television hand sewing. I bet u can do the next one quicker! 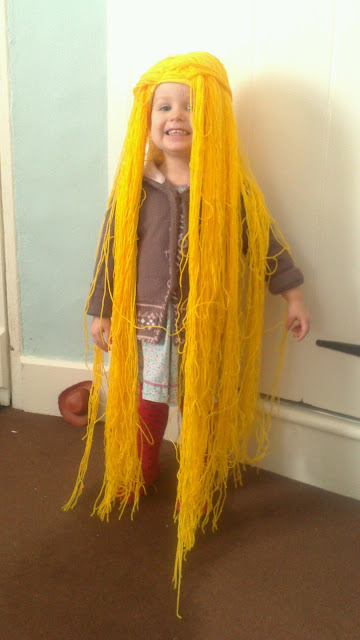 Will be trying to produce a Rapunzel dress next I think! Am dreading sewing with the slippy satiny fabric....deep breaths and lots of patience required!